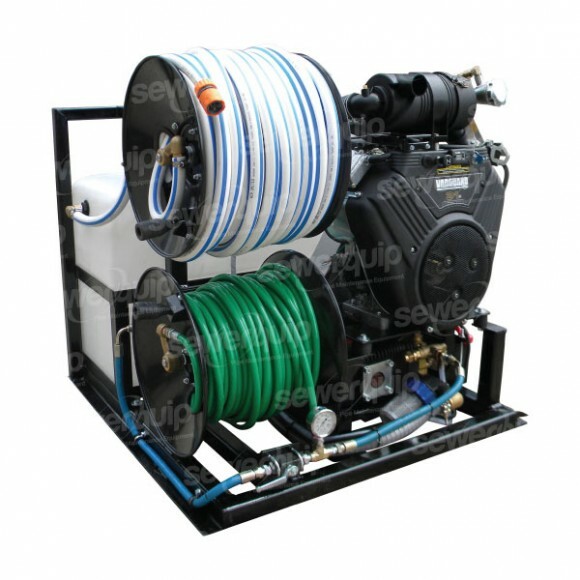 The SEWERJETT CUBE C4V150 is an extremely compact water jetter system that is designed to be fitted into small vans. The CUBE C4V150 water jetter has an impressive performance of 31lpm @ 4300PSI, this makes it the perfect jetting system for work in the city where access for larger truck mounted machines can be limited. Fits into small VW Caddy or Holden Combo vans. The CUBE has its own on board water storage, fuel tank and battery making it very easy to install. The CUBE C4V150 water jetters are manufactured in our Sydney warehouse and we ship Australia wide with overnight delivery to most major cities on the east coast like Sydney, Melbourne, Brisbane and the Gold Coast. 60m Supa tough ¼" x XR5000 Armorflex jetting hose. Optional Remote Control for simple one man operation.